The What: Extron has introduced the EBP 108 RAAP Rack Mount eBUS Button Panel. The EBP 108 RAAP is a fully customizable AV system control interface designed for use with Extron eBUS-enabled control systems. 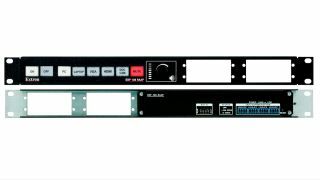 The What Else: This control panel connects to an IPCP Pro control processor to perform a wide variety of AV system functions such as power on/off, input switching, volume control, and more. The EBP 108 RAAP features eight dual-colored backlit buttons for operation in low-light environments and a volume control knob for precise volume adjustments. Four eBUS ports are available for system expansion. eBUS button panels are linked to a control processor and to each other using a single cable that carries both power and communication. The EBP 108 RAAP has openings for up to four single-space or two double-space AAP (Architectural Adapter Plates). “Our versatile eBUS family has grown to more than three dozen button panels,” said Casey Hall, vice president of sales and marketing for Extron. “This latest panel, the EBP 108 RAAP, is ideal for any application where convenient, rack-mounted control is needed. The Bottom Line: Extron’s eBUS technology is based on a digital bus architecture that allows for control system expansion, greater design options, and future upgrades. As with the company’s TouchLink Pro touchpanels, eBUS button panels are designed for use with any Extron IPCP Pro Series control processor. A single eBUS button panel can be used as the AV control interface for a smaller system or multiple button panels and touchpanels may be combined when a more elaborate control system is required.